Returning to Sydney Harbour 8 January - 16 February 2019. Program announced December 1. Tickets on sale 9am, 11 December. Located at Fleet Steps, Mrs Macquaries Point, our cinema is adjacent to the Royal Botanic Garden and set within the historic and protected Farm Cove. Each year we bring you the most exciting mix of preview and premiere screenings as well as a few of our recently released favourites. In recent years the event has come to be as much about the pre-film sunset hours. Typically, more than a thousand patrons gather well before nightfall to make the most of the event’s harbourside bar and restaurant, creating an amazing festive atmosphere that captures the spirit of Sydney in summertime. Then, as night falls, an unrivalled cinematic experience unfolds. 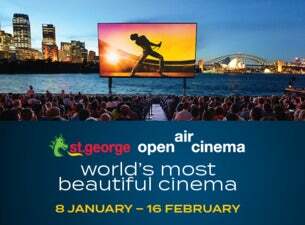 Our giant screen rises from Sydney Harbour to stand three storeys tall before an eagerly awaiting audience, in front of one of the world's prettiest backdrops. Stunning views towards the Opera House, the Harbour Bridge and the city skyline. A 2100-seat grandstand. Dolby Digital® surround sound.